Part of a sci-fi series, Leviathan Wakes is a highly recommended action packed novel. 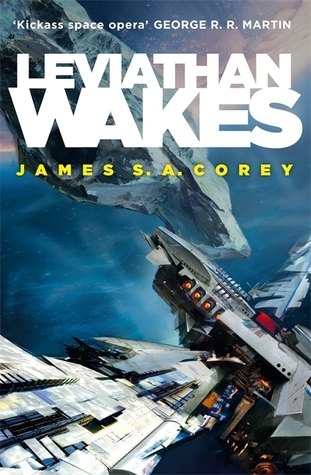 Leviathan Wakes is the first book of the sci-fi series, The Expanse, and it starts off on the ice hauler, Canterbury, where we are in the first person perspective of one of the main characters. Now, when someone thinks of sci-fi, they think of a futuristic landscape full of flying cars and things like that, however, Leviathan Wakes is quite different from that. It’s a much more gritty, realistic sci-fi bordering on dystopian, yet just kind of dancing on that knife’s edge mixed with a lot of mystery solving. That’s all thanks to another main character, a middle aged man named Josephus (or Joe) Miller, who’s beaten down by the workings of life as a detective for the law enforcement company, Star Helix, on Ceres station, a dwarf planet in the asteroid belt. The narrative switches between the crew on the Canterbury and back to Miller while the thrilling events unfold before them. I think it is necessary to say what the story is about in the first place. The Canterbury received a distress signal from a nearby ship and being the only ship in few hundred clicks (a term of measurement in the series), they were required to go help because of international law. They quickly ended up in a trap and got blown up by a stealth ship assumed to be Mars’, leaving Holden, an earther, Naomi Nagata, a belter (a person born in the asteroid belt), Alex Kamal, a martian, Amos Burton, and Shed Garvey, both earthers as the only survivors of the destroyed Canterbury. The destruction of the ship raised tensions between the Belt and Mars, since it was a belt ship getting ice and shipping it to stations that rely on imported ice to be melted later. After this catastrophe, the solar nations get into a huge political war. In the meantime, Miller receives a case about finding Julie Mao, a missing girl who he has to bring back to her parents. As with many good books, it starts off slow, but when it does start to build up, you won’t be able to put the book down. Leviathan Wakes is about the survivors of the Canterbury trying to find out who destroyed it, which later reveals that a research company found a super virus on phoebe, one of Saturn’s moons. They test it on a station in the belt to see what it did, killing a million and a half people who were living there. Some of the characters have internal conflicts when a critical decision had to be made. For example, one of the main characters and captain of the four, James Holden, who has a clear sense of right and wrong in his mind but sometimes is forced to do the wrong thing for the right reason. This book in general is a mishmash of mystery, politics, gritty realism, and of course sci-fi. Normally, a combination like this would usually end up turning into a confusing story, but this did no such thing. That is because of the authors Daniel Abraham and Ty Franck under the pen name James S.A. Corey. They mainly write sci-fi books of mostly The Expanse series, but with short stories and one other novel. Their writing style is very in depth and I would recommend it to anyone looking to be engulfed in another world!